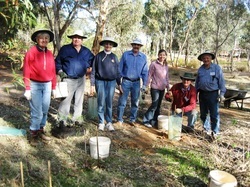 The work of the Friends of the Urrbrae Wetland is an essential part of the Urrbrae Wetland. They meet every Tuesday from 8.30am to 12noon and work on maintenance, planting, watering, weed eradication, open days and guided tours. Their work in caring for the wetland has created an extraordinary ambience about the wetland. They have turned a plant free, barren site into a wonderful indigenous, landscaped garden and seed bank as it might have been in 1836 prior to European settlement and land clearance. The volunteers have also created a most relaxing and invigorating experience for the visitor and the surrounding suburbs. For further information, contact the City of Mitcham on 8372 8888 or the Urrbrae Wetland Manager on 8272 6010.